few months back, I made a post on the EU forums (when I still wasn’t banned) about the ultimate Swiss tank destroyer. I think it’s kinda worth reposting for those, who don’t know this stunningly attractive vehicle. The Swiss company called MOWAG is not a newbie on the field of weaponry. In the 60′s, it competed for the German Marder IVF program with its own prototype and later it built several prototypes for the German Kanonenjagdpanzer program. From there on, the company used its considerable experience in creating a line of light tank destroyer designs – the Gepard and the Taifun. The Gepard (looked a lot like the German Kanonenjagdpanzer) was not successful in entering the service and neither was the other similiar project, the Tornado (designed as an IFV). 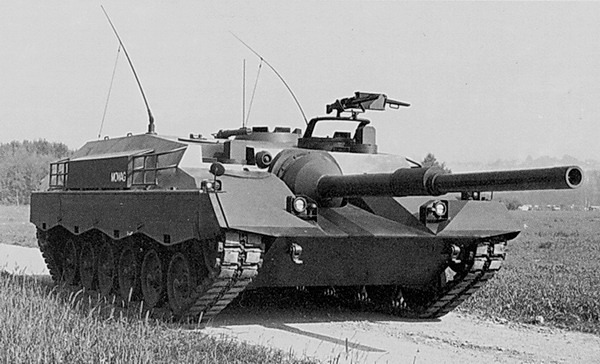 The development of both was privately funded, because the company expected Switzerland to start replacing the old AMX-13 tanks (classified in Switzerland as TD’s) and the US M113 APC’s. In the end, only a pre-prototype (functional model) was completed and the vehicle never entered service. It can be regarded as one of the last real tank destroyers and most likely (along with the S-Tank) one of the last turretless “oldschool” Jagdpanzers. The Taifun was basically a development of the Gepard (Tornado) chassis. It was a very light vehicle – its armor (50mm?) protected the 4-man crew basically only from HE shell fragments and from light autocannon fire (it could withstand only 25mm shells however). The armament consisted of the classic 105mm L7 clone (however, an upgrade to the Rheinmetall 120mm L/55 was considered – not an option for WoT though). The considered turbocharged dieselengine was a 575hp Detroit Diesel 8V-71T – the same to be fitted to the ill-fated Tornado IFV. Combined with the light chassis (estimated 25-30 tons), this vehicle could move fast. Real fast. As you can see, this vehicle looks badass. It’s like the ultimate Jagdpanzer IV on steroids. And crack. And heroin. While the project itself was developed in late 70′s (yes yes, I see you all rising your eyebrows now), its roots actually run into early 60′s. The chassis is old – it’s basically the same (although modified) chassis used for the 60′s Tornado – and that’s not so bad. The armor is obviously very thin (think 30-50mm), but – as mentioned above – the vehicle is very light and has a very powerful engine, therefore it will be fast. Really fast. Cca 70 km/h on the road is expected and that’s just the “basic” powerpack. With upgrades, it could be the tier 10 Hellcat-meets-Jagdpanzer. The main gun is adequate – the ubiquitous L7 is already in the game and despite the fact it would be fitted with advanced sights and other 80′s thingies in real life, one can easily imagine this vehicle having Leopard 1-grade optics. Naturally, in order not to get oneshotted by pretty much anything, the suspension would have to be really nimble, which is actually something totally new – we don’t have that in the tier 10 TD vehicles. Well, this is what I wrote roughly 6 months ago. Of course, this vehicle has extremely little chance to ever appear in World of Tanks, it’s too modern (at this moment, the unofficial time limit is set for 1969). A long time ago, when I was searching vehicles for my fan-made european tree, I found out that the NK 1 had two versions: Ausf. 1 and Ausf. 2. The later had its gun replaced with a howitzer, making it a good candidate for a spot in the arty branch. there should be more than enough tanks for a european tech tree. especially with nations like sweden and czechoslovakia wich can almost build full trees of their own. While true, so is that just words and not really related to how the tank actually acts in use. Either way ‘MBT’ is not a class used in WoT, so they should just use the one more fitting. TaiFUN sounds more fun to me. When every German tank is nerfed enough, SerB will unleash the nerf guns to the Swiss when they come out. Yes, because everyone speaks english. Why is it lame that the amx13 was a td in swiss? all of the td-s are ment to ambush the enemy tanks. hellcat was a real ambusher but they only used it near bastogne, how it supposed to used. all modern td-s are now light weeled IFV’s with 120 or 105mm at guns. The fact the Swiss redesignated AMX-13 as a TD is not lame, lame is the way I was forced to use an ingame LT as a tank destroyer. The French seem to like giving their recon stuff that kind of dual-role capability. Started in the later interwar period already (re: Panhard 178 and its 25mm antitank gun). I think the Nahkampfkanone 2 looks pretty cool, wikipedia gives it 5! km/h offroad speed, and 26 km/h on roads, now that would be fun ingame. Serb should get it in the game, so when someone complains about it, he can just reply: Nah. Did this tank have any gun-traverse or was it hull-traversing when aiming just like the S-tank?? Looks like the love-child between Hetzer and T28 in my eyes, and that is not bad. Not that much is known about it, but yes, it most likely did have traverse. Silentstalker got banned from the EU forums? How did that happen? Some of the NA forum’s best players and most regular contributors have been/are very close to being banned due to “moderating for fun” and a screw warning point system, while the NA mod staff runs the boards with an iron fist and seems more interested in preventing intelligent critcism of WG/mod staff decisions than preventing honest-to-god trolling. I take it that the WG EU mod staff is no more competent?